Following disappointing sales and results with the Formula Junior Lotus 27 and F2 Lotus 32, Colin Chapman decided that for 1964 Lotus needed a versatile single seater, based on the successful Lotus 25 and 33 monocoque F1 cars, which could accommodate a variety of engines to suit several applications. The Lotus 35 was the result. For F3 there were 1000cc units from Cosworth or Holbay while for F2, it could be fitted with BRM’s 4-cylinder Type 80 or a single cam Cosworth SCA. For the American equivalent of European F2, Formula B, there was the 1600cc Lotus Twin Cam while ‘down under’ it would suit the Tasman Series powered by the 2.5 litre Coventry Climax FPF. The Lotus 35 was to be driven by many of the star drivers of the day including Jim Clark, Jackie Stewart, Mike Spence, Frank Gardner and Graham Hill. It was seen in F3, won the British Formule Libre championship (with BMW power) and one was fitted with the Martin V8 engine for F1 in the hands of Piers Courage and Roy Pike. 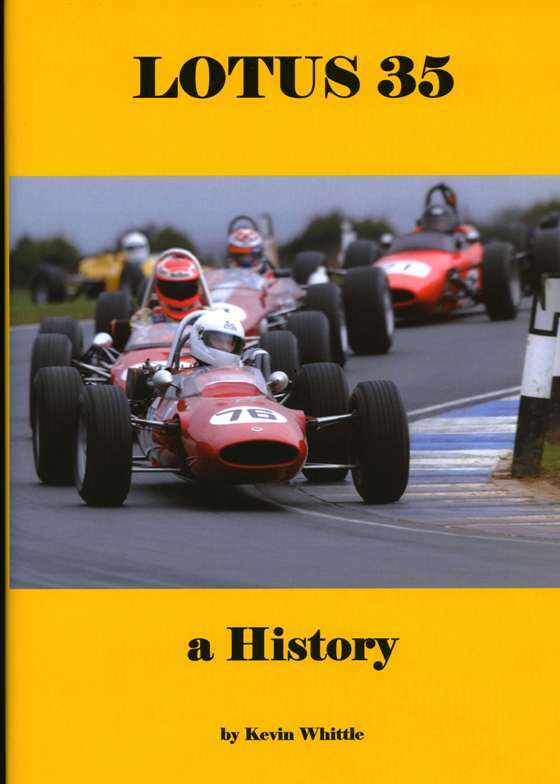 The Lotus 35 is therefore a significant contributor to the marque’s history and fully deserving of such a detailed account as that provided in this book. The author, Kevin Whittle, is well qualified to write it, being the owner of one of the surviving eleven or so examples of the Type 35 which he races from time to time. The book has been very well produced. Printed on heavyweight 170gsm satin paper, the photographs and other illustrations are reproduced to a very high standard which belies its relatively modest cover price. Price: £50 plus postage – £5 UK, £14 Europe, £19 USA and Rest of World. Hardback (11.8 by 8.27 in), 223 pages, 116 colour photos, 54 B/W photos and 60 period illustrations.